Outdoorz gallery designer Boris Bailly wins one of the coveted Arts Awards from the Rhode Island Arts Council, for his work entitled "Loaded Menorah". Established in 1967, the Rhode Island State Council on the Arts (RISCA) is charged by the state legislature to stimulate public interest and participation in the arts and to serve as the liaison to the state arts community. Bally is well known for his work using up cycled road signs to create unique chairs and tables. Bravo Boris ! Curated by Li Edelkoort the exhibition 'Gathering' continues till October 25. We've already mentioned it in a previous post but this new photo and poster inspired us to mention it once more. If you are in Israel be sure to see it, if you are in Paris, contact us for a viewing of Bench No3. French stylist Elizabeth Le Riche uses words as her theme for this years presentation at Maison & Objet. "Writing is becoming a pictorial object that is filling spaces, surfaces and materials. Graphic and typographic effects are writing a feast of words that communicates with poetry and meaning and revives our social bonds. The fontables from Outdoorz Gallery designer Andrea Paulicelli beautifully illustrate the concept. Featuring newest addition Tête à Tête table by Patrick Beyaert, Trimmer recycled sail cloth chair by Enrique Kahle and the unique Bench No3 by Floris Wubben. See you there ! of the extrusion profiles are endless; therefore there are also an enormous variety of exclusive objects. For more info about the pressed vases contact us, for more work by Floris, click here. Outdoorz Gallery is pleased to participate (again) at Now! le Off during Paris Design Week. Featured designers Dvelas from Spain, Patrik Beyaert from Belgium and Floris Wubben of the Netherlands will be exhibiting. Internationally renowned trend-forecaster and curator Li Edelkoort returns to Design Museum Holon with a new exhibition. In a world first, GATHERING will feature a survey of the ground-breaking 132 5. ISSEY MIYAKE collection by the legendary Japanese designer. Outdoorz Gallery designers Floris Wubben & Rami Tareef will also be featured. In this exhibition, Edelkoort, renowned for her visionary eye, brings together contemporary design themes that reflect traditional domestic crafts in an attempt to remain connected to authenticity: pleating, draping, layering, ribboning, smocking, wrapping, folding, needleworking, felting, knitting, quilting and baking. However, the designers in GATHERING apply new technologies and techniques to completely transform their actions. Their interventions celebrate the possibilities that lie in front of us, ever more creative than in the recent past. These designers use three-­dimensional craftsmanship, which reinvigorates design, lending body and beauty to archetypical chairs or giving form and volume to lighting structures. Edelkoort explains the show's context: "We are an unstitched society suffering from a lasting socio-economic crisis that has made us ferociously protective and egocentric. It is time for mending and gathering, thus restoring the fabric of society: picking up the pieces and bringing them together in a patchwork of possibilities; a quilt of substance, able to absorb shock and fear". Displayed in the museum's lower gallery, the 132 5. ISSEY MIYAKE collectionis revolutionary in its application of pop-up methodologies and ecological awareness as well as its efforts to sustain Japanese artisanal knowledge. Galit Gaon, Chief Curator of Design Museum Holon, comments: "GATHERING reinstitutes the economic, environmental, and social responsibilities of artisans and designers. Within this gesture, curators Li Edelkoort and Philip Fimmano expertly expand the current discourse about our future, examining the movement of contemporary design, its processing methods and the ways in which materials are used to create the new. As a museum for the 21st century, we strive to present a broad and fascinating gaze into design, spanning research processes, creative objects and theoretical issues." AD Germany has selected the Lodge chair by Outdoorz Gallery designer/sculptor Gerardo Baltasar Portillo for its "Essence of 2014" issue. Part of several museum collections Gerardo's work is art, sculpture and furniture in one. His light sculptural pieces are made by hand in his studio. See more work by Gerardo here. Second in a series of three exhibitions featuring Outdoorz Gallery designers and Street artists from Galerie 42b this latest expo features Floris Wubben's Bench No 3 and street artists including Gwenaelle Hugot, Celine Jegou, Nebay and Noe Two. The patchwork rhinoceros by Celine Jegou strikes just the right note when mixed with the bench. Also featuring Pressed Project vases by Floris. 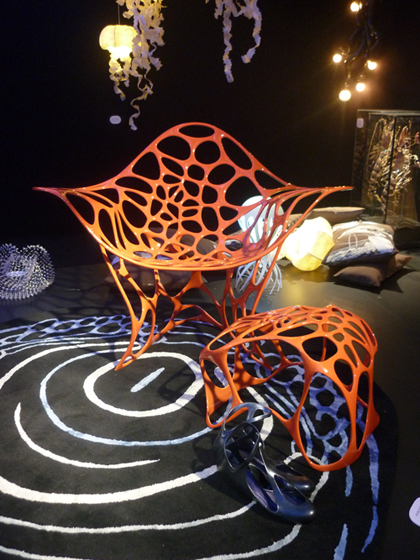 If you can't make it to the expo, visit Floris's design at the MAD Museum in New York or here at Outdoorz. Punti bench by Outdoorz Gallery designer Neil Nenner takes to the "street" this month in an exhibition featuring street artists Hopare, Meushay, Sack and Richard Trian at Galerie 42b. The first of 3 upcoming expositions at the gallery specializing in emerging and established street artists in France. Music by Groov'shakra, an event not to be missed ! March 3-28 Galerie 42b, 29 Avenue du Fouarre, St Maure des Fosses. The contemporary BMW Museum, by the Viennese architect professor Karl Schwanzer is designed to be experienced with all five senses. 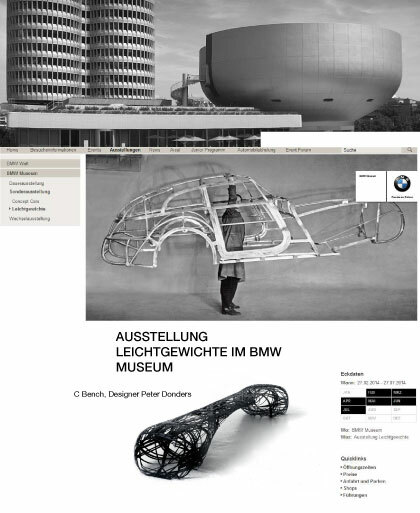 The museum features BMW's technical and design development throughout the company's history. It contains engines and turbines, aircraft, motorcycles, and vehicles in a plethora of possible variations. In addition to actual models there are futuristic-looking, even conceptual studies from the past 20 years. Parisian style agency Nelly Rodi with Vincent Gregoire is presenting "Elsewhere" at this season's Maison & Objet. As always the selection is exceptional and the presentation more so. Featuring Batoidea from Outdoorz Gallery designer Peter Donders, if you can't make it to Maison & Objet Paris see the fantastic Batoidea here. Come visit us at 34 Quai d'Austerlitz, Paris, during Paris Design Week and all summer till September 30. Join us Friday night for the inauguration of summer at the Cité de la Mode et du Design and the new Outdoorz Gallery. Designers Chloé de la Chaise and Welter Egon will present their projects, Double View Bench and Venise Table. Special guest, violinist Olivia Rebours. See you there. Come and visit us this summer ! Architectural Digest, German edition has chosen pieces from young designers Thomas Schnur and Jessica Carnevale of Outdoorz Gallery for their March edition on new outdoor looks. We love these pieces and are pleased that AD does as well. Check out Holzbank Bench and the Stretch Collection here. 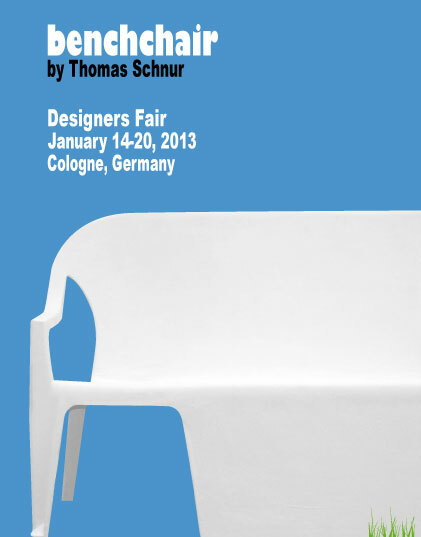 The NEW limited edition Benchchair by Thomas Schnur will be presented during IMM Cologne as part of Passagen 2013. Germany‘s biggest design event opens the international design season with new projects and exciting presentations in the field of design. As a forum for current trends and tendencies in design, architecture and urban lifestyle, it offers over 200 shows by international designers and manufacturers, young creative networks and universities, newcomers, the media and agents. Along a route that takes in particularly the Cologne city center and the creative neighborhood of Ehrenfeld, the venues where 100% design can be found include the „furniture mile“ on the Ring boulevard; the Belgian Quarter; the area near the Kunstverein at Neumarkt, where Architektur& Wohnen presents the Designers of the Year, the Bouroullec brothers; and in the Rheinauhafen harbor area. It also includes the Design Post in Deutz, and the area that surrounds the tower at the former Butzweilerhof Airport.